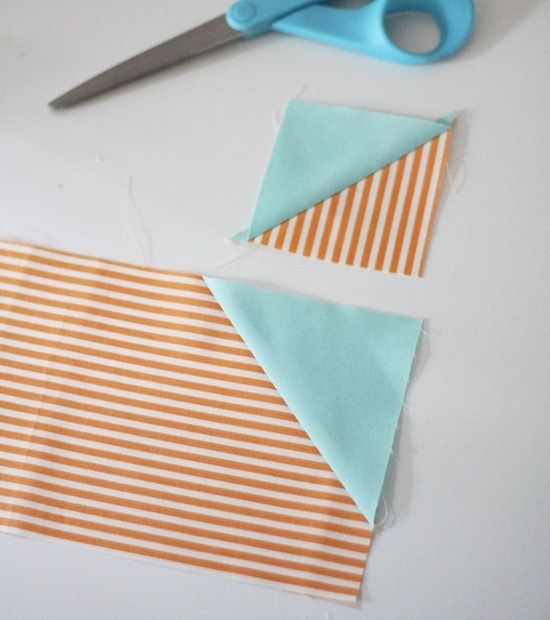 I’ve been using this trick to save my scraps and make half square triangles while I’m at it. 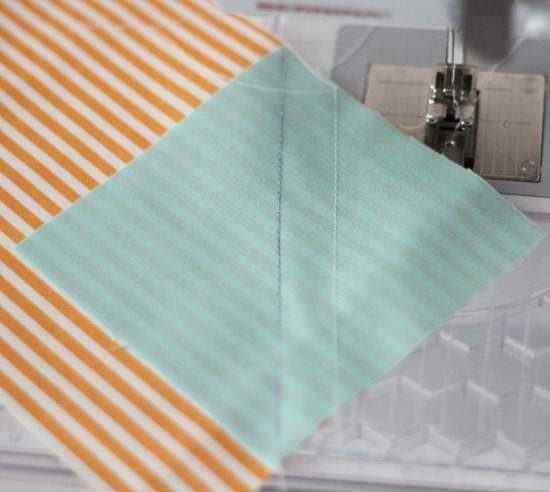 It’s a great method to use when your adding stitch-n-flip corners to a block. Press, and you’ve got your block with the triangle corner, and a half square triangle. 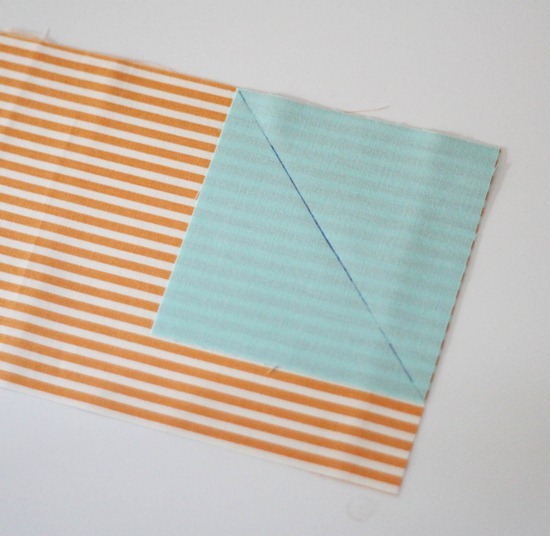 The half square triangle will be 1″ smaller than the original corner square you sewed on. So this corner square was 4″, and my half square triangle is 3″. This is a great trick for patterns like Pow Wow where the corner squares are large and it creates a lot of waste. good tip. i try to do this often. That's a wonderful idea ! Sew thoughtful of you to share this! Thanks! Fantastic idea … very clever! Great idea to share! I did this once with a pattern I was making and the leftover HSTs were 1 inch! I used them to make mug rugs! There was as much fabric in the seam allowances on the back as there was on the front! Ugh, this makes me feel wasteful. I keep thinking I should do this! What a great idea. Hugs…. I do the same thing, especially when making flying geese. Just need to work out what to do with all the HSTs! I do the same too, now I just need some ideas what to do with them all! What a fabulous tip! Thanks! Great tip! I love finding ways that doesn't waste! I do this too. I hate the waste so bad!! I made a baby quilt from my Swoon scraps. Such a good idea – thanks for posting it:). I've always been put off patterns which seem to create so much triangular waste but not now! When I made my son and daughter-in-law a quilt two Christmases ago, I had a lot of half-square triangles left over. I used this trick and turned all the extras into a matching quilt for their pug!! It was a win-win situation! I made this when making my Swoon blocks and will possibly have enough HSTs for a zig zag pillow matching my Swoon quilt once it will be finished. I mark two lines that I sew on instead of one but the rest and the effect is the same. I read this tip at Fromthebluechair. I was just getting ready to start a project that use that technique and was thinking there has got to be an easier way to save and use those HST that I trim. Thanks for the hint. What a genius idea! Thank you for sharing! That's such a great idea. I never save all those little triangles because if they're really small they can be such a pain to work with… but I could totally find a use for a bunch of little half-square triangles! Thanks for the tip. Why didn't I think of that? I learned this tip in a quilting class. I thought it was so clever and do this when I can. I have quite a few, now just need to come up with a project for these small hst. What do you do with yours? I always do this! 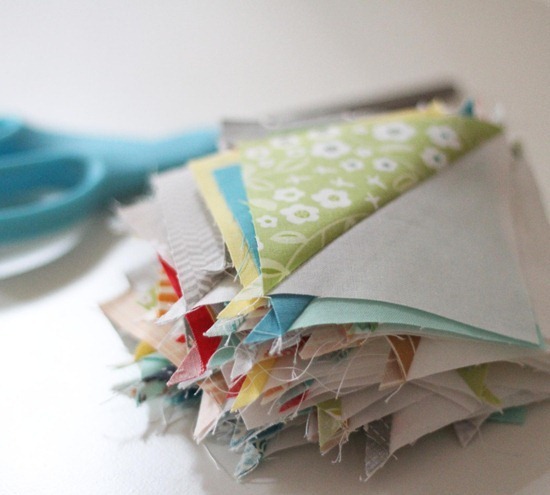 Between this and using enders and leaders and chain piecing, you can end up making multiple quilts at once in almost the same amount of time (and save money!). One other tip to add: Press the block for the first time to set the stitches before cutting off the hst – cuts down on the ironing time, too! The one thing I've learned, though, is be sure to buy some extra background fabric. I have tons of wonderful teeny tiny chevrons I put together from tiny hsts, but I can't get any more of the great white background fabric that I used, so my awesome design idea went by the wayside! I'll have to rethink it! Uh! So smart! Why didn't I think of this 104 triangles ago (last week)? I will do it faithfully from now on. That's a really great idea thank you. I'll have to remember that next time I'm doing triangles. Thank you for sharing. It's a good tip, but I don't need a new project right now. Happy sewing! What a neat idea! Thanks for that – now all I need is remember to do it! Brilliant! Thanks for the tip! 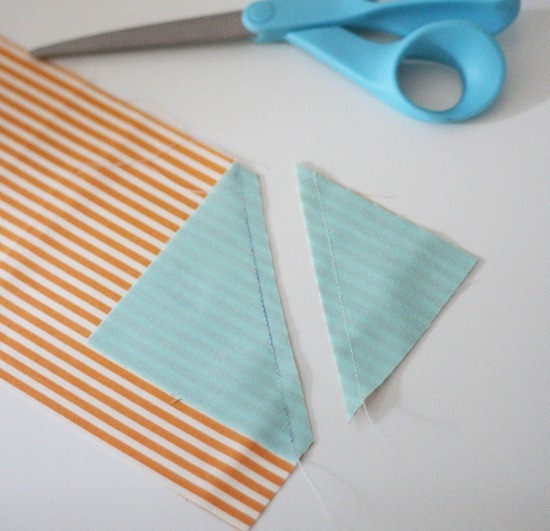 I ususally sew on both sides of the diagonal line. I made a "hugs and kisses" quilt and with the scraps I made my "pinwheels galore". Great tip! I just finished a queen sized quilts using mostly left over scraps turned into hst's that I did for a year. I do have the advantage of having a go cutter so it made it real easy to cut a stack of scraps at a time. Just over a year I had enough to throw together a quilt for a wedding gift when I suddenly needed one! what a great tip. i've seen this before in a quilting class i took, but had forgotten about it. it's nice to be reminded of wonderful ideas. What a great idea. I've kept so many of these triangles. now I'll go sew them together to make them much more manageable for future use. Thanks! I should do this too. Thanks for sharing.